The Right Faculty. The Right Tools. 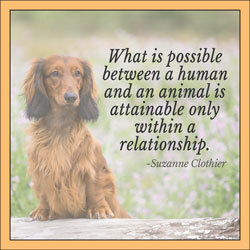 We understand that dogs are sentient beings and family members to the people who love them. We are committed to training using methods that are not only effective but that are based on science and are dog friendly. Positive reinforcement methods that encourage and help your dog to have a voice. We teach our students to train their dogs using science based methods that utilize positive reinforcement and dog friendly techniques. Our qualified instructors have diverse backgrounds. We are dedicated to being honest about our training methods and techniques. We bring together the art of handling with the science of training for maximum results. Our methods are effective and have been successful in shaping successful show dogs with impressive accomplishments. 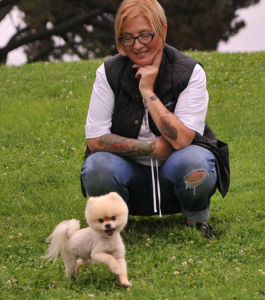 Vicki Ronchette is the founder of Show Dog Prep School and a Certified Professional Dog Trainer. Vicki has been working with dogs professionally for over 30 years as a professional dog trainer and behavior consultant, groomer and veterinary assistant. She is the author of Positive Training for Show Dogs, From Shy to Showy and Ready? Set. SHOW! Vicki presents workshops and seminars all over the country on how training show dogs. Vicki Ronchette has lived with dogs her whole life. She began working with animals professionally in 1985 when she received a certificate in Veterinary Assisting while still in high school. She began training dogs in the late 80s when she started training her own dogs for competition obedience. She has competed in various dog sports and has attained multiple animal training certifications including CPDT (Certified Pet Dog Trainer), CAP2 and CNWI. In 2016, after years of teaching all levels of pet dog classes and offering behavior consulting Vicki restructured her business to focus on conformation training, canine conditioning and bird training. She owned a grooming shop throughout the 90s and realized in 2015 that she missed grooming and began working at Fluff Dog Grooming on a limited basis. 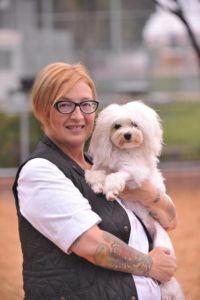 Vicki is the author of Positive Training for Show Dogs – Building a Relationship for Success, From Shy to Showy – Help for Your Shy Show Dog, Ready? Set. SHOW! – A Handbook for Dog Shows and has written numerous dog training articles. Her articles have been published in the Chronicle of the Dog, The Whole Dog Journal, Best in Show Daily, Bay Woof and many other publications. Vicki also has a DVD available to help people learn more about using positive methods to work with show dogs. She is an AKC licensed Dachshund and Basset Hound Field Trial Judge and has bred and finished many Dachshund championships and field championships under the kennel name Braveheart. 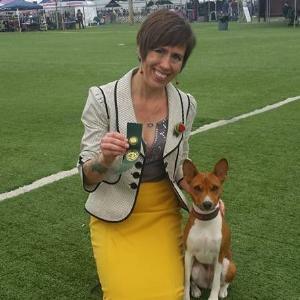 While she considers herself a trainer, not a professional handler, she has handled other people’s dogs to their championships and other wins as well as coaching clients to championships and national rankings in the conformation ring. What Vicki truly enjoys is helping people train their show dogs and problem solve specific issues they may be having in the ring. She is the founder of the Positive Training for Show Dogs Facebook page and website. Vicki is committed to training animals using positive, science based methods and continues to take courses and attend seminars and workshops from respected trainers, behaviorists and authors to continue her education and skill set. See a list of many of the seminars, conferences and workshops that Vicki has attended HERE. Cherie Ekholm has been living with rescue and purebred Bichons Frisés since 1992 and showing since 2010. Cherie holds certifications in rehabilitation, performance and maintenance massage from the National Board of Certification for Animal Acupressure & Massage, and is a certified Tellington TTouch practitioner. Her business, Wrapped Up In Dogs, focuses on integrating behavior and bodywork to build great dog/people teams. Cherie Ekholm has been living with rescue and purebred Bichons Frisés since 1992 and showing since 2010. Cherie holds certifications in rehabilitation, performance and maintenance massage from the National Board of Certification for Animal Acupressure & Massage, and is a certified Tellington TTouch practitioner. She is an avid applied animal behavior student. Her business, Wrapped Up In Dogs, focuses on integrating behavior and bodywork to build great dog/people teams. She aspires to someday be able to decently show groom her own Bichons. Working with and training dogs since 1993 has given Andrea a wealth of hands-on knowledge that she eagerly shares with dog owners. Andrea brings to Show Dog Prep School a commitment to share her knowledge and a strong desire to strengthen a healthy bond between people and dogs. She is currently active in conformation showing, lure coursing, Rally and Canine Nose Work and is a proud member of her local and national breed clubs. Working with and training dogs since 1993 has given Andrea a wealth of hands-on knowledge that she eagerly shares with dog owners. She finished the highly regarded Canine Studies Program taught by Cristine Dahl as valedictorian giving her a strong grounding in canine education in addition to her real world experience. This provides the tools to share her enthusiasm and talent in helping people with their dogs and creating life-long, harmonious partnerships. Andrea brings to Show Dog Prep School a commitment to share her knowledge and a strong desire to strengthen a healthy bond between people and dogs. Andrea’s Continuing Education includes: 2015 Clicker Expo, “Positive Training for Show Dogs” & “Stepping Up Your Game” 2 day workshops with Vicki Ronchette; Kim Moeller’s “Dog Aggression Workshop”; “Helping Fearful Dogs” seminar by Nicole Wilde; “Deconstructing The Growl” seminar, presented by Dr. Sophia Yin & Sarah Kalnajs; Dr. Ian Dunbar’s “Science Based Training with Feeling” seminars; Veronica Boutelle’s “Dog Walker Academy”; Veronica Boutelle’s “Dog Pro” seminar; five week aggression course as SSCS. She has also been a Certification Instructor for Veronica Boutelle’s highly regarded dog*TEC Dog Walker Academy. She is currently active in conformation showing, lure coursing, Rally and Canine Nose Work and is a proud member of her local and national breed clubs. Her dogs have been very successful in multiple venues. Here Andrea proudly poses with Regan, BIF GCHB DC FoPaw’s Touch of Evil at Saorsa RN SC ITD AOM. Laura is an AKC Breeder of Merit and Member of the Professional Handlers Association. Laura is a second-generation breeder, focusing on German Wirehaired Pointers under The Scotia Kennel banner. 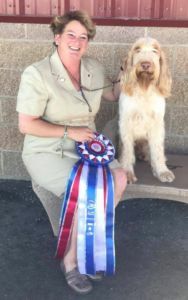 In her professional handling career, spanning nearly 25 years, Laura has finished hundreds of dogs, winning each of the seven variety groups. Specializing in low-entry breeds and challenging dogs, she has piloted multiple dogs to Best in Show, Best in Specialty Show, Group wins, National Specialty placements, #1 rankings and more. Laura is an AKC Breeder of Merit and Member of the Professional Handlers Association. Laura is a second-generation breeder, focusing on German Wirehaired Pointers under The Scotia Kennel banner. In her professional handling career, spanning nearly 25 years, Laura consistently maintained a low-number, high-quality client list. She has finished hundreds of dogs, winning each of the seven variety groups. Specializing in low-entry breeds and challenging dogs, she has piloted multiple dogs to Best in Show, Best in Specialty Show, Group wins, National Specialty placements, #1 rankings and more. Laura’s Scotian GWPs have earned more than 100 titles, in the show ring; in hunt tests, field trials and NAVHDA (North American Versatile Hunting Dog Association); in agility, tracking, obedience and rally. Her dedication to breeding dual-purpose dogs reflects a stated goal of preserving the all-weather, rugged, sound-minded versatile gun dog the breed’s founders envisioned. She spent her childhood training field trial Labs with games of baseball to improve their blind retrieves and teaching Clumber Spaniels how to swim. She has trained numerous German Wirehaired Pointers to field titles and has participated actively in horseback pointing breed field trials. Laura served the GWPCA as AKC Gazette columnist, Judges Education Committee member and chair, Vice President, President, National Events Coordinator and more. Her background as a newspaper reporter, marketing rep and researcher/writer for audio driving tours has served her well in her side projects. Her current adventure as host of the PureDogTalk podcast lends her particular combination of skills to an outstanding exhibitor education platform. Join Laura at www.PureDogTalk.com or on iTunes, GooglePlay or wherever you get your podcasts, to listen to nearly 100 hours of educational input, insight, interviews and ideas. Laura’s weekly column “As the Wheels Turn” ran continuously for three years on the Best in Show Daily website. Alexandra is Certified Professional Dog Trainer – Knowledge Assessed (CPDT-KA) with the Certification Council for Professional Dog Trainers. She is committed to using scientifically sound, positive methods to achieve the ultimate goal of happy, well trained dogs. Alexandra is currently the Head Trainer at Cascade Kennels in Woodinville, WA and teaches Group Classes, Private Lessons, and offers other services covering a variety of topics. She regularly goes to seminars and conferences by some of the most prestigious trainers in the country to stay up to date on the latest techniques, as well as reading books and watching videos by other professionals. There is always more to learn and that information is directly passed down to you! Alexandra has been training dogs professionally for the last ten years and has been involved in a variety of dog sports since a young age. She began showing her Labrador Retrievers in Junior Showmanship, Conformation, and Obedience and since then she has been an active part of the dog world. She has been involved in many aspects of the pet care industry (boarding, grooming, daycare, pet supply store, assisting professional handlers, etc.) but training dogs has always been her passion. Teaching people how to more effectively communicate with their dogs is her greatest joy. 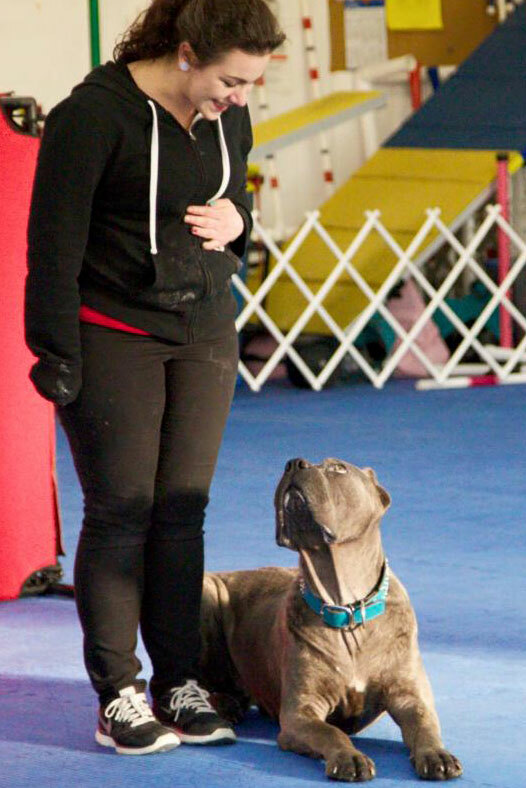 Aside from teaching pet dogs how to be good doggy citizens, Alexandra competes and trains with her Cane Corsos and Lowchen in Conformation, Obedience, Rally Obedience, Agility, Lure Coursing, Barn Hunt, and Trick Training and has put numerous titles on her dogs in a variety of venues using reinforcement-based methods. As a member of the AKC Canine Ambassador Program, Alexandra and her dogs also give presentations in schools and through youth organizations promoting responsible dog ownership, safety around dogs, and promoting the sport of purebred dogs. She looks forward to helping you and your dogs achieve the goal of becoming excellent breed ambassadors. In 1974, Michele Pouliot began her career as a licensed guide dog instructor when she joined Guide Dogs for the Blind (GDB), the second-largest guide dog school in the world. In addition to personally training more than 350 guide dog teams over 20 years, Michele contributed to major change in the organization by leading the adoption of clicker training in the formal training of guide dogs and in the development of puppies raised for guide dog work. Michele also developed the education program for GDB’s blind clients learning to clicker train their own guide dogs. Michele Pouliot began her animal-training career through her love of horses. Immediately after high school, she attended the Pacific Coast Equestrian Research Farm, studying under the tutelage of Linda Tellington and Wentworth Tellington. After graduating at the school’s highest level, Michele remained there as an instructor, until her next position, managing an equestrian center in North Dakota. It was there Michele acquired her first dog—a move that would change her life and career. 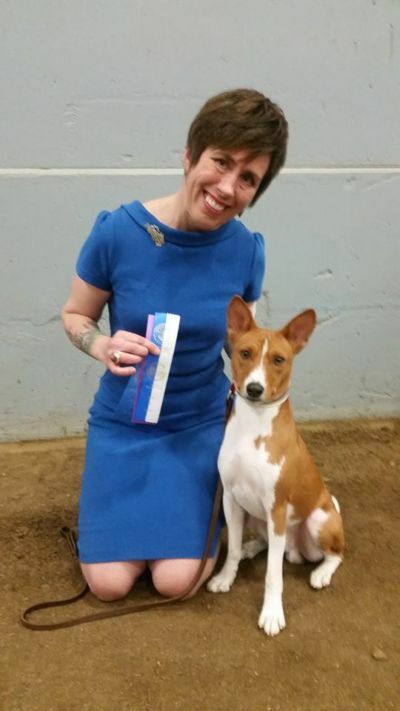 With dog-training pointers from a former riding student, Michele became fascinated with her dog’s willingness to learn; she spent all of her spare time training him. It was then that Michele’s path changed toward a career in dog training, which progressed to guide dog training. 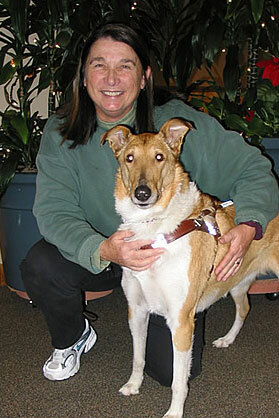 Michele has been a pioneer and leader in the guide dog industry worldwide. Since 2005, GDB and Michele actively support and assist other guide dog schools in crossing over from traditional training methods to positive reinforcement and clicker training techniques. To provide further education to more individuals, GDB and Michele have held 5-day Guide Dog Clicker Conferences for international guide dog professionals. In 2016, the International Guide Dog Federation presented Michele with a Lifetime Achievement award for bringing clicker training to guide dog programs around the globe. 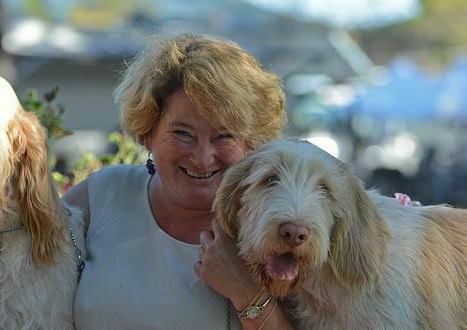 Michele retired from her 42-year career with GDB in 2016 but continues to provide workshops around the world, for guide and service dog organizations. Michele has also been very active and successful in canine dog sports. She was heavily involved in competition obedience for 20 years, winning four Obedience Trial Championships with her personal dogs. Michele also competed in tracking and in the sport of agility. In 2005, Michele discovered the new sport of Canine Musical Freestyle and with help from her first freestyle partners Cabo and Listo became a leader in 2 years. Her current performance partners are Déjà Vu and Saké. Michele and her dogs have attained over 10 Championship and Grand Championship titles, and are winners of national and international freestyle competitions. They are known for entertaining routines with very creative behaviors. Michele and Listo made history in the World Canine Freestyle Organization as the first team to ever receive perfect “10” scores in both Artistic and Technical categories! They repeated this incredible achievement 23 more times with six different routines. Michele travels extensively giving seminars on clicker training for dog sports and for effective clicker training in general. She is well known for clarity in her teaching, her enthusiasm for training, and her love of animals. Michele loves to spend time at home, in Oregon, with her dogs and her horses. A member of the ClickerExpo faculty since 2008, Michele teaches at both the USA conferences and the Europe conferences every year. In 2009, she partnered with Karen Pryor Academy (KPA) to create an online Canine Freestyle course. The course has received rave reviews from students and is popular even with clicker enthusiasts who are not involved in the freestyle sport. Sayli entered the dog world at a time when, and through sports in which, progressive, humane and scientifically backed methods of training were the norm and she’s committed to being a +R trainer and handler. 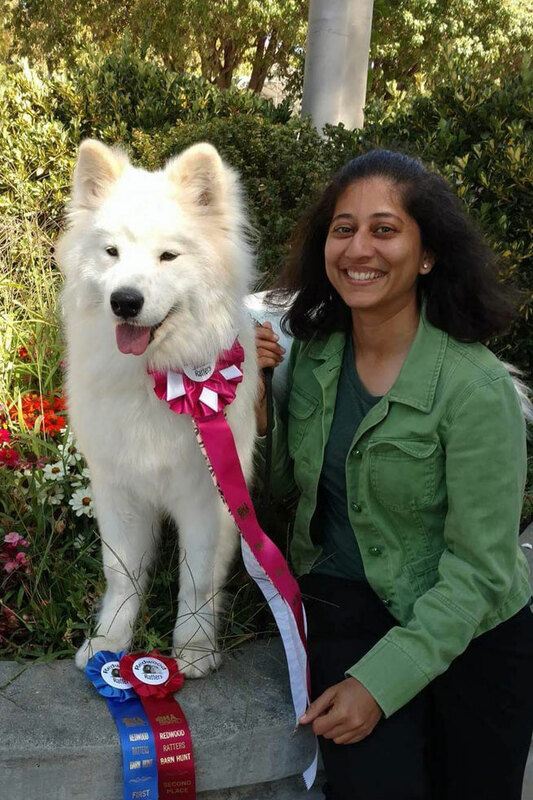 She is a Computer Engineer by profession and loves to geek out on the theory of things – animal behavior and cognition, animal training, the biology and conditioning of sport dogs, canine olfaction, nutrition, etc. She is a dedicated student at local in-person and well renowned online sport dog training schools. Sayli Benadikar was pulled into dog sports by her two Samoyeds (pun intended!). With her in tow they participate in Conformation, Barn Hunt, Agility, Nosework and Coursing. Sayli also enjoys the simple pleasures of dog companionship – hiking and swimming with her dogs and posting carefully curated photos from these activities on Instagram. She can be seen volunteering at the dog sport venues she competes in and is an active member and past officer of her local breed club. Sayli is excited and honored to share her owner-handler, multi-dog-sport, novice-friendly perspectives with the learners at Show Dog Prep School. Kristen is a California Registered Veterinary Technician since 2002 and Certified Canine Physical Rehabilitation since 2005. She is President of the Academy of Physical Rehabilitation Veterinary Technicians and holds a VTS (Physical Rehabilitation) since 2017 with training in canine massage, osteoarthritis case management and recognition as a Certified Veterinary Pain Practitioner. 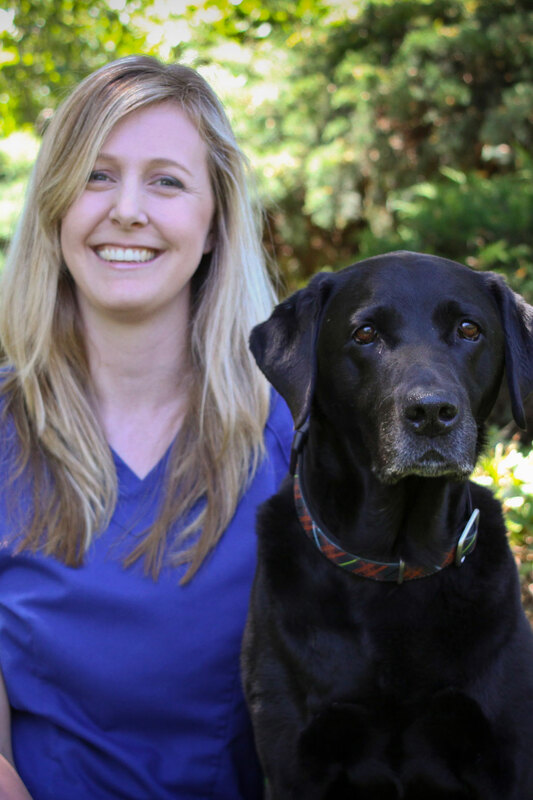 Kristen is a technician associate member of the American Association of Rehabilitation Veterinarians and has interests in orthotics, geriatrics, sporting, performance and service dogs and multidisciplinary pain management. 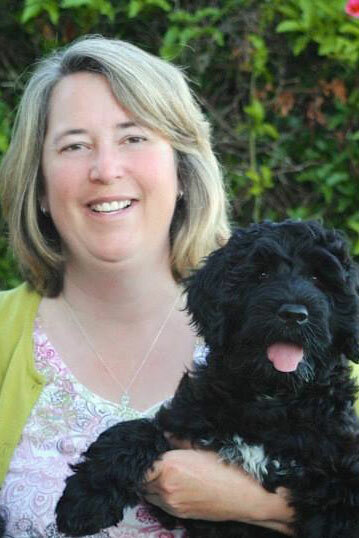 Jenna Bullis is the Director of Breeding and Canine Development at Guide Dogs for the Blind, (USA). GDB is the largest guide dog school in North America and Jenna plays a critical role in making this happen by overseeing the largest breeding colony in this region — mostly Labrador Retrievers with smaller numbers of Golden Retrievers and multi generation Golden/Lab crosses. Jenna works with other service schools around the world by sharing adult breeding stock, puppies, and genetic material, she also frequently consults with other service dog programs on breeding and early socialization topics. Jenna started her career at GDB in 1997 and spent her first 14 years as a Guide Dog Mobility Instructor training dogs and clients. She began training with positive reinforcement techniques in the 90’s, has extensive education in those methods and regularly continues her education in this area by attending conference, seminars, and keeping up on the latest research. 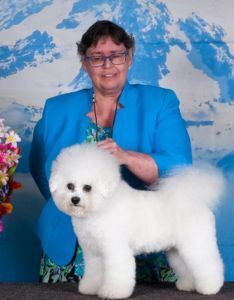 She has been active as a breeder and competitor in AKC conformation and performance events since the early 90s with her Rottweilers and now Portuguese Water Dogs. She handles her own dogs in the conformation ring and regularly trains and titles in Agility, Obedience, Rally and Water Work. She holds a Bachelor’s degree in Psychology from San Diego State University with an emphasis in Animal Behavior.